Tribe is a free group video messenger app for Android and iPhone. Using this app, you will be able to start a group video chat with up to 8 of your friends. If you wish to have a facetime with a group of your friends in one single screen, then this app is probably the best solution for that. You can simply invite up to 8 contacts to a video chat and then go live with all of them at once. No more using heavy group video chat software to get in touch with a group of your friends live. You can add friends to a group from your phone contacts or Facebook friends who are also using Tribe. In addition to that, it also lets you search for global Tribe users and then add them as your friend to have video chat. Apart from having a group video chat, you can also have a private video chat with any of your friends you want. Nowadays, millions of people all over the world use WhatsApp for having conversations with friends. It even lets you have group conversations by adding more than 2oo contacts. However, you can only send text messages to your group and it doesn’t allow you to have a group video chat with your friends. This is where Tribe comes to the rescue as you can create groups and invite up to 8 of your friends to each group for having a group video chat. Note: This app is available for both Android and iPhone, but I have only tested and reviewed the Android version in this post. After you open the “Tribe” app, the first thing you need to do is enter your phone number and then verify it with the code you receive. After that, it will ask you to set up your profile by selecting a username and your profile picture. Once you do that, the main screen will appear with a “Search” bar at the top. 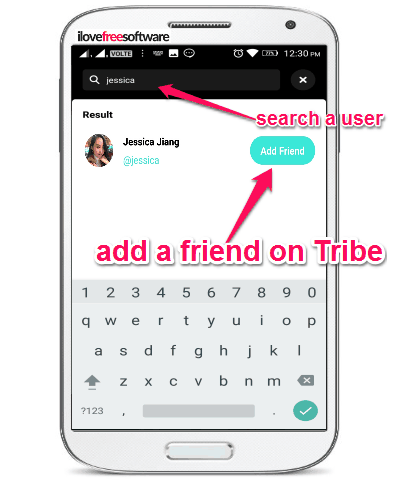 Now, you would need to use the “Search” bar to find and add friends on Tribe. When you search and find a user, you can add the user to your friend’s list by tapping on the “Add Friend” button. In the same manner, you can add friends from your phone contacts, Facebook account, or global Tribe users. When you’re done adding friends on Tribe, simply press the “New Group” button at the top of the main screen. After that, a new screen will appear where all your added friends will be visible under the “People you know” section. Now, to add members to the group, you can simply tap on the “Add in group” button associated with each friend. It lets you add up to 8 friends to a single group. 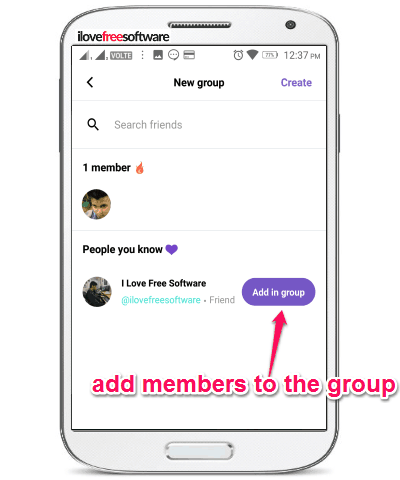 After adding members to the group, you need to tap on the “Create” button to save this group. All the saved groups will be visible on the main screen. Now, to start a group video chat, all you got to do is tap on any of the groups which you have created. As soon as you do that, all the added members will receive a slider notification asking them to join the video chat. 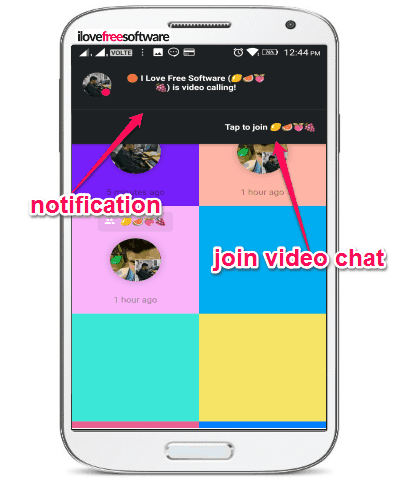 As soon as the group members join the video chat, you will be able to have a video conversation with all of them on one single screen. 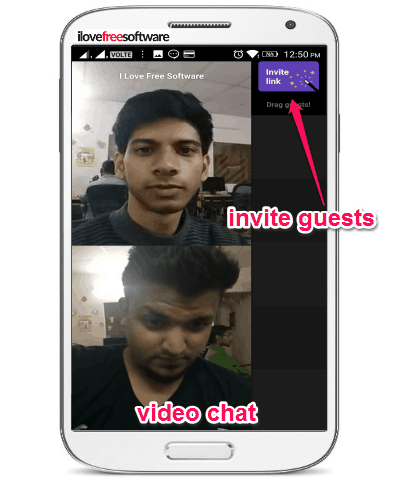 While having a video chat, you can also invite guests by sending invitation links from the left of the screen. It even allows you to select any of the added friends from the main screen and start a one-to-one video chat. Tribe is a pretty interesting group video messenger app for Android and iPhone which makes a group video chat very easy and fun. 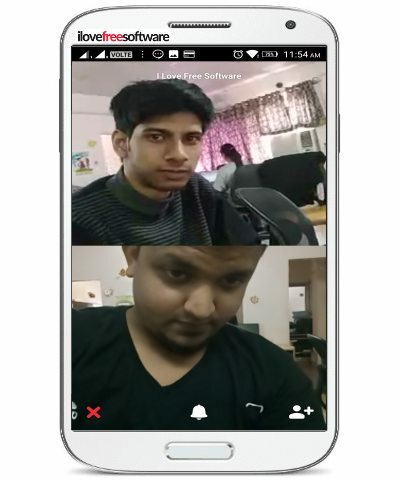 If you have a decent Internet connectivity, then this app will help you have a seamless group video chat. Personally, I like this app as it lets you have a group chat with 8 of your friends and also you can start a private one-to-one video chat. Get “Tribe” for Android from here. Get “Tribe” for iPhone from here.